Charles Hoskins, an Australian steel industry pioneer, initiated the Hoskins Trust in 1919 for charitable purposes endowing a fund to support the Hoskins Memorial Church which was completed in 1928 as a family memorial and gift to the people of Lithgow. The family of Charles Hoskins subsequently expanded the Trust to include additional purposes such as this new scholarship. The Hoskins Lithgow Scholarship was awarded by the Trustees of the Hoskins Trust for the first time in 2006. The scholarship award is to encourage and enable young Lithgow residents to achieve their full potential as Charles Hoskins did. The scholarship also honours his memory and commemorates the Hoskins family's connection with the City of Lithgow, which began in 1908. In that year G & C Hoskins Limited purchased the insolvent Eskbank Ironworks and developed the enterprise into Australia's first successful iron and steel works. 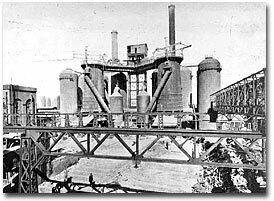 The steelworks were moved to Port Kembla in 1928 in order to have easier access to the raw materials required and to be closer to sales markets. The company became Australian Iron and Steel Limited (A.I.S.) with the move to Port Kembla. In 1935 A.I.S. was taken over by The Broken Hill Proprietary Company Limited and is now the separately listed BlueScope Steel Limited. The scholarship was first awarded in 2006 and is now awarded annually. It is awarded to a student residing within Lithgow Local Government Area who wishes to undertake a tertiary course of study. It should be noted that areas of study are not necessarily limited to university study.